Okay, I tried, but there is just no way to make carbon monoxide interesting. Read it anyway, because it’s good for you: you need to know this stuff. Like eating your vegetables. Every one of us encounters carbon monoxide on an almost daily basis, because it is ubiquitous and sneaky. We need to know where it comes from, how to avoid it, the symptoms it causes, and what to do if we or our children are exposed. Carbon monoxide (CO: one carbon, one oxygen) is a colorless, odorless, tasteless, and initially nonirritating gas produced largely by partial oxygenation of carbon based fuels. Complete oxygenation would produce carbon dioxide (CO2), which we exhale every time we breathe. Plants use that to make us more oxygen. CO can accumulate in poorly ventilated, enclosed areas. When we breathe in large amounts, the CO binds with the hemoglobin in our blood and forms carboxyhemoglobin. Carboxyhemoglobin circulates through our bloodstreams like the regular stuff, but it does not like to release its oxygen to our brains, hearts, muscles, and organs. We suffocate while still breathing the air around us. Aristotle, who lived around 300 BC, was the first person to note that coal fumes led to “a heavy head and death.” In ancient times, it was one way criminals were killed: they were locked in a small room with smoldering coals. It is thought that CO is to blame for some haunted houses: its accumulation can cause hallucinations, disorientation, and delirium. Oddly, a little CO can be a good thing: it is an anti-inflammatory, encourages growth of nerves and blood vessels, communicates between nerves, and may have some function in long term memory. Very little. Don’t go looking for it. Statistics on CO poisoning vary significantly with who’s reporting them. It is considered to be the leading cause of poisoning injury and death worldwide. Poison help lines in the US report about 15,000 calls a year, with an estimated 70 deaths. Approximately 40,000 people seek medical care for exposures, and CO accounts for around 15,000 ER visits each year. The CDC estimates more than 500 deaths per year overall in the US, with the largest percentage being in the under 5 age group. More poisonings occur in the winter (gas heaters) and after disasters (generators). Symptoms of acute (not chronic) CO poisoning include effects on the brain (dizziness, headache, confusion, lethargy, drowsiness, irritability, irrational behavior), lungs (shortness of breath) and heart (palpitations, paleness). If exposure continues, loss of consciousness and death will follow. Chronic exposure to lower levels of CO can result in headaches, depression, confusion, memory loss, nausea, and permanent neurologic damage. Pregnant women, fetuses, and children are especially sensitive. As with most poisonings, children’s small bodies are more sensitive, their higher metabolic rate brings it into their bodies more quickly, and they don’t have the ability to escape. People with lung, blood, or heart disease, like asthma or anemia, are also more susceptible. Of note is that CO damage from methylene chloride can last twice as long as that from burning carbon based fuels, because it is stored in our tissues. Overall, it is a good idea to prevent any exposure to CO. Maintain and inspect those appliances, and make sure they are vented. Open the flume when you have a fire in the winter. Never barbecue or use a hibachi indoors. Throw out the cigarettes, because people who smoke have levels of CO in their blood streams several times higher than non-smokers. Perhaps most important, since you can’t smell this stuff, install CO detectors near every area where people sleep. Many newer fire alarms contain CO detectors, making this even more convenient. If you are exposed, go outside into clean air. If you are having any symptoms (light-headedness, shortness of breath, seeing ghosts…) seek medical attention. They will give you oxygen and monitor your heart and brain. Yay! You made it through, even the dreaded chemistry. Not as bad as you thought, right? Knowledge rules! Prevention of poisonings is the grunt work of parenting. It is completely boring, repetitive, and endless. It is also absolutely necessary. I will try to make it as painless as possible. First, some statistics to motivate you. In 2013, there were more than 1 million calls to poison help lines for children under 6 years of age. That’s almost 3000 kids a day exposed to potential poisons. 29 children died. Not that big a number unless, of course, yours is one of the 29. Let’s keep that from happening. The phone number for poison control is 1-800-222-1222. Stick it on every phone in your home, input it into your cell phone, and also into the grandparents and babysitter’s cell phones. Hopefully you will never need it. The number one thing that will keep your children from being poisoned is your attention. They can’t get those pills off the counter or that detergent from under the sink if you are watching them. Unfortunately, it is impossible to watch every child every minute of the day, so do safety proof your house and your habits so bad things won’t happen during a moment of inattention. Store poisons up high (kids can’t reach them), out of sight (they don’t see them and become curious), and locked up (when all else fails, they can’t open them). Make the locks automatic so you don’t have to remember to lock them as the phone is ringing. Keep poisons in their original, labeled containers. Don’t ever put poisons in anything that looks like a food container. I once had a child drink gasoline out of a big soda cup. Don’t keep poisons in a purse, because kids love to explore purses. And because no-one keeps purses locked up and out of sight. Keep the original child safety caps on everything, even though they are a pain. Throw away poisons that you no longer need or use. Don’t take medicines in front of a child, because children are excellent mimics; never call medicine candy, because they like candy. So, what is a poison? Lets keep the definition loose: anything a child can ingest, absorb through their skin, or inhale that will do him or her harm. Another list! Button cell batteries: They can eat right through the gut. They are in remote controls, key fobs, musical cards and books… Keep them out of reach. Medicines, including vitamins, minerals, iron pills, and herbals: these are all more dangerous in a child’s tiny body. Cleaning supplies: drain cleaner is a nightmare, bleach burns, abrasives abrade, furniture polish oozes into their lungs… Lock ’em up! 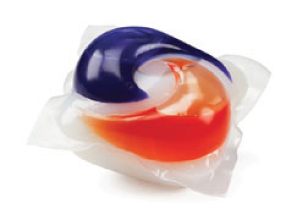 Lock up those little laundry detergent packets too. Pesticides: yuck. They cause fever, tiny pupils, vomiting, breathing problems, twitches, seizures, and death. Respect pesticides. Car stuff: gasoline, antifreeze, wiper fluid… Make yourself a high spot in the garage, too. Heating stuff: coal, wood, and kerosine heaters need to be kept clean and in good working order; Kerosine and lamp oil are on the lock up list. Install smoke detectors and carbon monoxide detectors since you can’t lock up smoke. Alcohol: you wanted to lock that up anyway, didn’t you? Kids drop their blood sugar when they drink alcohol, and can go into a coma. Tobacco: The big worry is the liquid nicotine for vapor refills. 1/2 tsp can be toxic, they are not regulated, and they do not have child resistant caps. Small magnets: not fun when two of them get together on opposite pieces of gut. Now, about those habits. We tend to get stuff out of those locked spaces to leave on the counter, in a purse, or sitting open where we are working. Regret is not a fun emotion. Neither is guilt. Don’t leave those pills on the counter and go get a drink to swallow them with; pour out the drink glasses immediately after the party, put away the cleaning stuff before answering that phone. Be aware of any poison you have out, until it is locked up again. The one thing that messes up all this preparation and care is a holiday, with all its incumbent disruption. Be especially vigilant during a holiday, a special occasion, or when you have guests. Stuff is everywhere, everything is hectic, and no-one is watching the kids. Suspect a poisoning when your child vomits, has a strange odor, has staining on their clothes or around their mouths, burns around their mouths, or when there are open containers around. If they look OK, call the poison help line, and be prepared to tell them what you think the child took, how much, how big he or she is, and where you are. Have the bottle in your hand when you call. If something splashed into their eye, rinse it with tepid water for 15 minutes. Hold the eye open and aim the water at the corner by the nose. If the poison is on their skin, take off the clothes covered with the poison, and rinse the child in the shower for 15 minutes. If the child inhaled the poison, take them outside into fresh air. If your child is unconscious, having trouble breathing, or seizing, call 911. Take a CPR course, because everyone should. Prevention of poisonings may not be the most fun and inspirational thing you do as a parent, but if you set the house up right and then watch your habits, you will never have reason for regret.